Luis Vasquez is restless. The frontman and sole permanent member of post-punk project The Soft Moon has called countless cities his home, currently residing in Berlin after pulling up stakes from California a decade ago and following his muse to Buenos Aires, San Francisco and Venice. 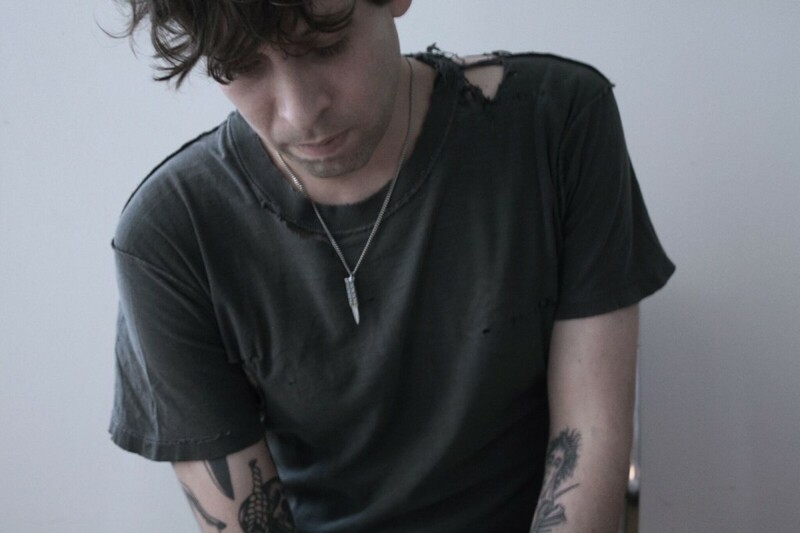 As a musician, however, his path is more linear, having launched his catalog with a dreamy, moody self-titled debut before delving into more textural industrial and coldwave on 2012′s Zeros and building up a more physical, live-band post-punk approach on 2015′s Deeper. The Soft Moon’s evolution is constant and consistent, continually bringing Vasquez closer to realizing a darkly powerful musical ideal. Criminal, out Feb. 2 via Sacred Bones, is The Soft Moon’s most visceral, intense record to date. Opening with the buzzing industrial stomp of “Burn,” it feels even more urgent and angry than previous album Deeper. It’s a palpable and genuine anger, pulled from a deeply personal place, wherein Vasquez grapples with ideas of self-loathing, familial traumas, depression and guilt. On some level, it shouldn’t be an easy album to listen to. But it’s also a highly satisfying sensory experience in spite of how emotionally draining it is, in large part because of the fact that it rocks so hard. But it’s also the most personal recording Vasquez has released to date. After four albums and nearly a decade, he needed to accelerate up the exorcism. Speaking from a rehearsal studio in Venice, Vasquez is candid and cordial about the anxieties that went into creating his intense new album. But he also doesn’t sugarcoat the struggle. Treble: You’re living in Berlin now, and previously were in Venice. Are you a naturally nomadic person? Luis Vasquez: I guess I am. I think what I like is putting myself in…taking myself out of my comfort zone. I enjoy that. I enjoy making life a little bit harder on myself. I kind of put myself in survival mode. It started when I moved to Buenos Aires, I got a one-way ticket. I kind of got off on the fact that I bought a one-way ticket, had never been there before and only had $500 with me. And I ended up staying for a year. This was nine years ago, and I ended up going to San Francisco after that. But I wanted to go to somewhere in Europe and just continue a journey and let it take me wherever. Treble: Your music has taken kind of a journey as well. When working on new album Criminal, did you take a look back at what you had done before, or does that not factor into your songwriting? LV: I did. For me, I kind of want to balance out my entire discography. At the same time, it’s also very organic. It’s not like I’m forcing it to be a balanced discography. So I do look at, as an artist, everything overall. The first record was more lo-fi, a little dreamier and more darkwave. And then Zeros was kind of conceptual. And probably a little more gothic, I guess. With Deeper, I kind of went more melodic and was into more conventional song structures. So because that album was melodic, I think that’s why it led me to do something more harsh. At the same time, it’s also organic because, I mean, I was naturally feeling emotionally angrier. It’s a journal. It’s just an autobiography of my life and evolution as a human. Treble: Criminal, like your previous records, is aesthetically quite dark. Is that something you find yourself drawn toward naturally? LV: Yeah, it’s weird. It’s something I haven’t quite figured out yet. Even before The Soft Moon. I’ve worked on solo stuff here and there, pre-Soft Moon. No matter what genre I was dabbling in, it’d always come out dark. At one point I thought, I wonder what it’d be like to work on some drum ‘n’ bass, and of course it came out really dark drum and bass. I even wanted to do some experimental jazz, and it ended up being just some dark jazz. It’s just something that’s inside of me. Everything I create ends up quite dark. Treble: Do you tend to write everything alone, or do you invite in collaborators? LV: I work completely alone. I tend to write in a personal environment, just an apartment. For Criminal I rented out a basement studio in Berlin, quite small, claustrophobic, very much alone. I need to feel completely comfortable. I need to be able to express myself without anything holding me back, so in order to do that I need to be alone. I don’t want to be held back. If there’s someone else involved, I feel like I might be a little embarrassed or shy, and I don’t want those kinds of limitations. This is an autobiography of my life, it’s like a diary, and it’s about understanding myself and learning to grow, so it’s very much a solo project in all aspects. Treble: Is it cathartic, working through some of these complex emotions in your music ? LV: Completely. All of it. Every moment I’m working on a song, the live aspect of it, it’s completely cathartic for me. That’s why it’s important to me. LV: I mean, at the same time as it’s cathartic and rewarding, it’s also a burden. It’s very hard. It’s very hard to sit down and work on this kind of music, because I’m having to face things that I’ve perhaps hidden away. I’m trying to…going back to the darkness, why does everything I touch become something dark? I’m trying to figure that out. And in the process, it’s like I’m learning about myself and it’s kind of freaky. I’m kind of messed up, you know? I need to work on myself, because I don’t want to feel like this. Ironically it makes cool music and people relate to it, but it’s difficult. It’s painful. Treble: Is the term Criminal directed at anyone or anything in particular? LV: It’s directed at myself. I have a lot of guilty conscience from growing up Catholic. That stuck with me, and I’m working on it. But in order to answer a question like this, it takes time. I need to tour and look back at everything. But I could be calling the album itself “criminal,” the risks I’m taking and the aggresssion. To confess, to be more literal with my problems. I’m expressing specific things where it’s more metaphorical. There’s a song called “Like A Father,” and it’s obviously I’m talking about the father I’ve never had. And I’d never do something like that before. I’d be very vague. Treble: Do you have any particular hopes or goals for your music in terms of how it’s perceived? LV: Yeah, I like the fact that there’s a connection. That people who hear it feel they’re not alone. Because that’s what I was looking for in the beginning. When I wrote the first record, it was like I was the only one feeling this way. And over time I realized there was a connection. Fans would write me, and still write me, during times of turmoil or loss. People like us are not alone. We need that, because people that are more on the depressed side or anxious side tend to feel alone. Treble: Has that led to more of a face-to-face connection while on tour? LV: Yeah, people come up to me as well. For some reason…my fanbase is really strong. More so in Europe, but I have these die-hard fans that really feel from the moment they meet me they feel they’re really close from the get go. It’s probably because I give so much of myself and my emotions with my music. So right away something clicks. They’ll drive hours just to come to my shows, take flights—it’s kind of crazy.